ACQIRIS has introduced two new CompactPCI digitiser cards that increase the speed and ease-of-use of high-resolution (12-bit) multichannel systems. The Models DC438 and DC436 feature two channels using state-of-the-art 12-bit ADCs to sample signals at rates up to 200 MS/s and 100 MS/s, respectively. Suitable for multichannel applications requiring both speed and precision, the cards offer specifications that include signal-to-noise ratio (SNR) of up to 62dB, spurious free dynamic range (SFDR) of more than 75dB, total harmonic distortion (THD) less than -73dB, and effective number of bits (ENOB) of more than 10. The CompactPCI form factor of the new cards makes it possible to install from one to twenty modules in a single crate (such as Acqiris Model CC121, 21-slot crate) to build economical and efficient multichannel systems with from 2, 4, 8, and up to 40 input channels. To handle a wide range of input signals such as those encountered in automotive electronics, vibration testing, ultrasound, automated testing, physics experimentation, medical imaging, lidar, and NDT, the cards provide fully buffered inputs. The DC438's bandwidth is in excess of 100MHz, making the unit ideal for fast pulses or signals with rise and fall times down to 3.5ns. The DC436 offers 50 MHz of bandwidth for rise times of > 7ns. Full bandwidth is available on all gain ranges from 250mV to 10V full scales, and with offset up to ñ10V. To ensure that signals are acquired with maximum fidelity, the units also have a unique time base with outstanding precision (better than ñ2ppm). Both units have a standard acquisition memory of 32 kpoints/channel that can be optionally increased to 2 Mpoints when long duration signals are being acquired. For example, the DC438 with the 2 Mpoint memory option can acquire signals up to 100MHz in frequency, at a sampling rate of 200MS/s, for a period of 10ms. The large memory allows maximum time resolution so that fine signal details can be recorded and measured. In addition, the units have an external trigger input that comes with a TV trigger capability for positive video modulation and for allowing line and frame selection (odd & even) for the common standards PAL/SECAM and NTSC. Other general purpose capabilities include segmented memory modes (with trigger time stamping), pre or post-triggering, and rapid data transfer to a PC. Because the cards are often used in multichannel situations, they also include Acqiris' proprietary ASBus and Ctrl I/O technology. ASBus is an asynchronous clock and trigger distribution system that allows multiple digitisers to be connected together for precision cross-channel timing in multichannel applications. Ctrl I/O provides a number of high-speed front-panel analogue (for clock and trigger control) and digital (for card configuration and status) inputs and outputs. 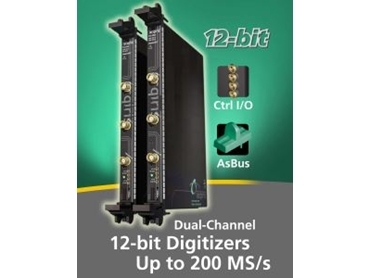 ASBus and Ctrl I/O can be used to greatly increase measurement accuracy, reduce digitiser setup times, and dramatically improve the response time of large systems. Packaged in the 6U CompactPCI format, the digitisers can be used in any of Acqiris' standard CC series crates. Data collected by the digitisers can be transferred to a host PC, or an embedded processor, at speeds of up to 100MB/s. Acqiris also provides software so that both the Model DC438 and Model DC436 can be used with PC systems running under Windows, LINUX or VxWorks.